record was found for George David. He was born January 24, 1865 and was baptized at St. Mary’s church on February 11, 18652. No additional baptisms were found for any other children including James. It could be that the other children were stillborn, in which case there may not be a baptismal record; or, the baptism was done at home and not recorded. 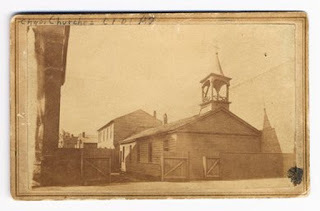 More likely, the records were burned in the Great Chicago Fire in 1871 including those for Holy Name church, the closest church to the family when they were living north of the Chicago River in the early 1860s. Township, McLean County, Illinois as shown in the U.S. Census in June of that year3. Patrick lived on a farm near Saybrook, Illinois. (See previous blog on Illinois Prairie Years.) We don’t know when James and George moved to McLean County. It may have been after their mother, Johanna, died in 1872; but probably after the death of their father, Thomas, in 1875. They were certainly there when Patrick’s wife, and caregiver of the orphaned boys, died at Christmas time in 1878. What a sad holiday that must have been! These boys had now survived so many tragedies in their short lives – the Great Chicago Fire, the deaths of their mother and father and several siblings, an accident that nearly took the life of their Uncle Patrick4, and now the death of their Aunt Anne5. And earlier in the year, in April 1878, a cousin, William Henry Brown, came to live with Patrick and Anne because, he too, was orphaned. Although James and George were not in Ohio when William’s parents died, they would have been affected by these deaths as well6. James and George probably lived with Uncle Patrick on the farm in McLean County until late 1883 or early 1884, some five or six years after the death of Aunt Anne. Patrick’s daughters were getting married, and his sons were leaving to establish their own homes. Patrick, too, left Illinois before December 1885 to homestead in Nebraska. (See previous blogs on Homesteading, and " . . . and he leaves a large family to mourn his death".) Perhaps more important to James and George was the news that the health of their grandmother, who had always been with them, was failing. The Bloomington newspaper, The Pantagraph, included a notice on May 23, 1883 that, “Old Mrs. Brown, Patrick Brown’s mother, is sick with dropsy, but is some better7.” We also know the city directory for Chicago in 1885 shows Mrs. Hannah Brown living with her daughter, Mary Gray, at 175 S Jefferson. (See previous blog on Butcher-Baker . . .) It would make sense, with Patrick leaving the area, and Hannah Brown moving back to Chicago to be with her daughter (where she probably died a short time later), that the boys – at least George David - would have returned to Chicago with their grandmother. The whereabouts of James is less certain. In 1885, James would have been about 238. He is not shown in the household of his Aunt Mary Gray, but, would have been old enough to have his own residence. There are many entries for James Roach/Roche in the Chicago city directories from that era, but none that can specifically be identified as him. He may have lived elsewhere, perhaps even with Patrick Brown and his sons in Nebraska; however, it is believed that James lived in the Chicago area - at least he was there at the time of his death in 1905. A family story says that James visited his brother, George, in Salt Lake City on his return trip to Chicago from Los Angeles where he had been treated for tuberculosis; and, perhaps also received treatment for his illness while there. sprang-up as treatment centers for the disease. California was an area that actually advertised for people to come for “the cure.” (See ad right) By the mid 1890s, the medical community began to recognize that tuberculosis was contagious and established programs to halt the spread of the disease. One measure was the development of sanitariums: clean, spacious environments for the wealthy; tent cities or more crowded facilities for the poor. Where an inflicted person was once lovingly cared for at home, they were now isolated from others in institutions. While everyone was doing what they could to curb the disease, it was not until the late 1940s that drugs were developed to treat tuberculosis no longer making the diagnosis a death sentence10. The date of James’ trip to California is not known, nor is the exact location where he was treated, or how long he had the disease. 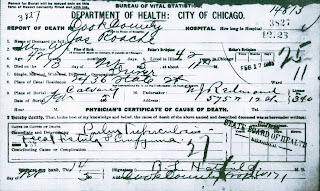 His death certificate shows that he died from pulmonary tuberculosis at the Cook County Hospital on February 13, 190511 at age 42. 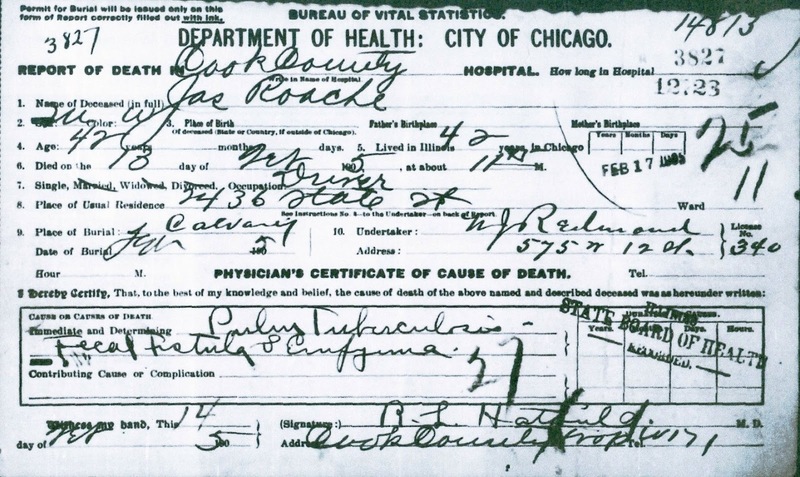 (See death record left) His usual address was 2436 State St., he was single, had lived in Chicago for forty-two years, and his occupation was given as “driver12.” James was buried in Calvary Cemetery in Chicago, but, not in the plot with his mother and father. He was buried with other members of the Brown family in a separate plot13. that George was born in 1865. Why he would have given an incorrect age is not known, since at age 19, he would have been eligible to enlist anyway. 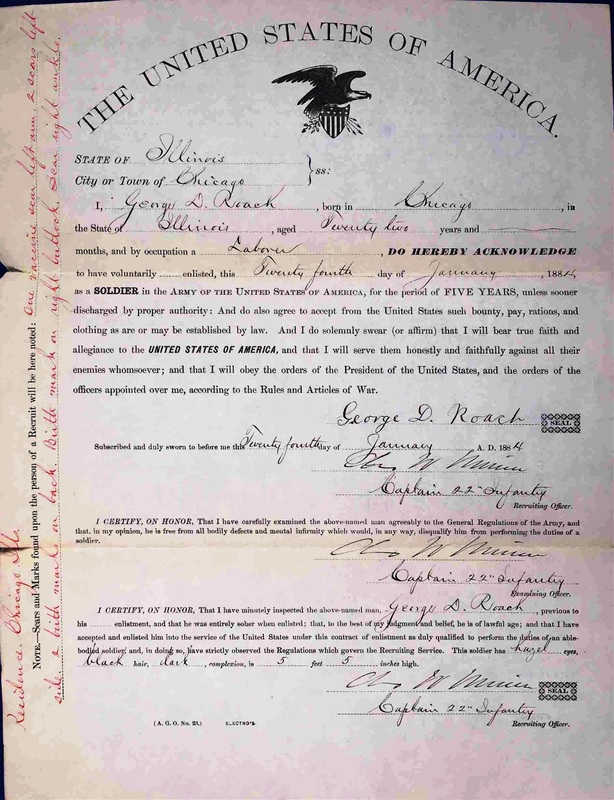 A description of George is given on his enlistment document. (See attached enlistment record right) He was five feet five inches tall, with black hair, dark complexion, and hazel eyes. It is interesting to note that he had a vaccination scar on his left arm, probably for small pox. His residence was given as Chicago14. Lewis, Colorado. Fort Lewis was located in the southwest corner of Colorado near Durango and the silver mines in the San Juan Mountains18. The post provided protection for settlers working the mines. George continued at Fort Lewis until January 23, 1889 when he received an honorable discharge. Because of the harsh winters in the area, it may have taken George some time to return to Salt Lake City where he made his permanent home. Drighlington, Yorkshire, England19. She was the daughter of Hannah Hepworth. Hannah and her children immigrated to the United Stated in 1869. George and Emily were married in early 1888 and eventually had eight children: Lawrence Chester, Grace Hannah, Mildred Irene, Bessie Josephine, Annis Edna, Elizabeth QV, James, and Nellie Mae. Lawrence was born while George was stationed at Fort Lewis. 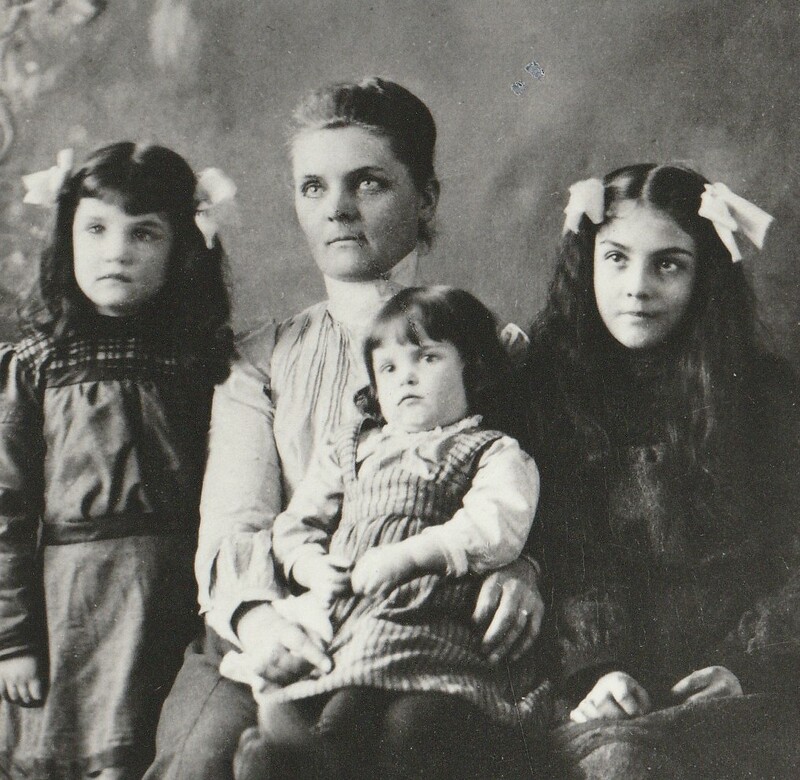 Tragedy struck the family when, in a ten day period in late June and early July 1902, George and Emily lost two of their daughters, Mildred, age 10, and Elizabeth, age 2, to diphtheria20. According to the family, the photo, above left, was taken because Emily had a premonition that the two children would die soon. Six children lived to adulthood, married and had families of their own. Balmforth Roach died at St. Marks Hospital in Salt Lake City of shock following surgery for cancer on May 13, 191722 leaving two minor children, Nellie and James. She is buried in City Cemetery in Salt Lake City, Utah. 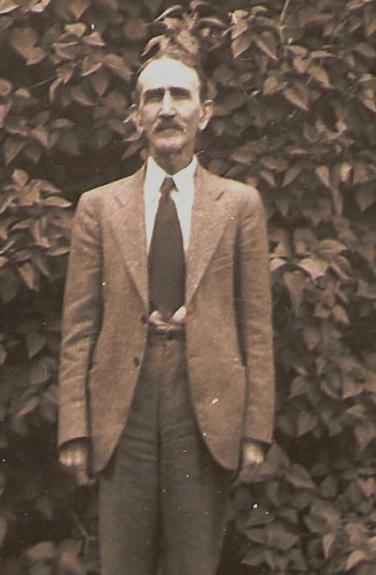 Sometime in the mid 1920s, George married a second time to Eliza Jane Brown Stone, the widow of Henry Joseph Stone. This marriage ended in divorce by September 193023. House Rule 12532 of the Sixty-Ninth U.S. Congress, dated March 3, 1927, provided a pension for any person with active military service of thirty days or more in any Indian War, hostility or campaign between 1817 and 1898 based on disability and age24. George’s service at Montezuma Creek in 1886 made him eligible for a pension. 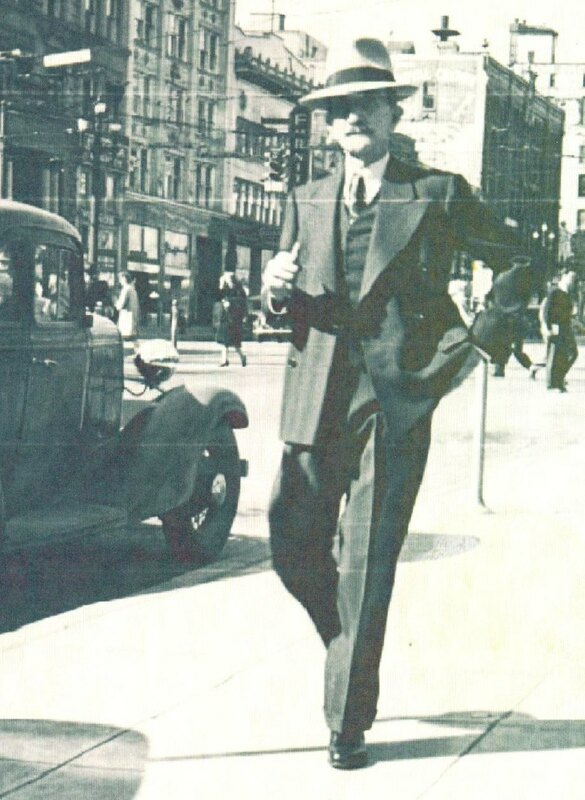 George applied for his pension in November 1931 and was approved in April 1932 with payments retroactive to the date of filing25. George also collected Social Security Benefits from, at least, 194626. At about that time, due to failing health, George moved in with his daughter, Grace, until she too became ill. After that, George lived with another daughter, Nellie, until his death on January 28, 1955 of pneumonia at age 9027. George is buried in Salt Lake City Cemetery with his wife Emily. One final note about the Roche/Roach family – From letters saved by descendants, the family knows that a grandson of George David and Emily Roach visited relatives in Chicago in the late 1970s; however, just who he visited is not known. There were still descendants of Hannah Kelly Brown’s sister living in Chicago in those years; but, it cannot be determined if they visited the Brown side or the Roach side (or both). That part of the story has been lost. Special thanks go to the descendants of George for their diligent work in uncovering George’s baptismal record and providing the information for this blog post. The next post will be about another of the original immigrants – James Brown. 1. 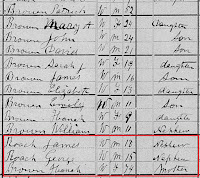 While the census record shows that George is older than James, subsequent records (1880 US census, and the death certificate for James) identify that James is actually the older brother and that the ages of the boys were reversed incorrectly in 1870. 2. Illinois, Chicago, Catholic Church Records, 1833-1925. Database with images. FamilySearch, http://FamilySearch.org; 8 February 2017. Catholic church parishes, Chicago Diocese, Chicago. St. Mary Parish (Chicago: Old, Michigan Ave), Baptisms 1859-1906, page 120-121, image 69 of 289. 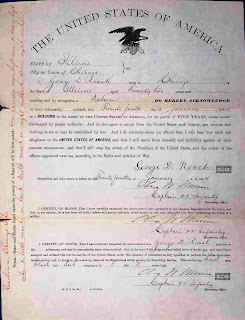 This document was discovered before Find My Past indexed births, marriages, and deaths from the Chicago records. They are now available online. Holy Name was originally established in 1846 on the northeast corner of Superior and State in the north section of Chicago. 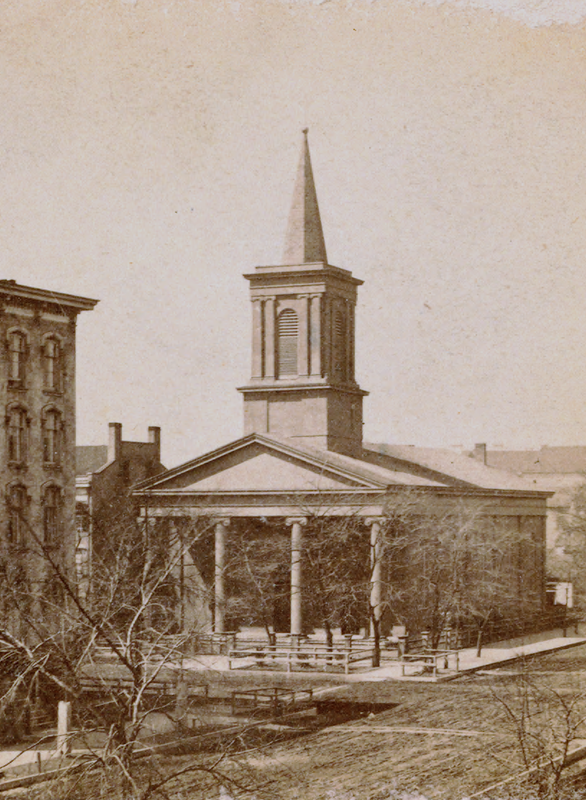 It was also destroyed in the fire of 1871. Baptismal records for 1872 and later are available at Family Search. Earlier records are not available. 3. "United States Census, 1880," database with images, FamilySearch (https://familysearch.org/ark:/61903/1:1:MXVK-JQ7 : 15 September 2017), Patrick Brown, Bell Flower, McLean, Illinois, United States; citing enumeration district ED 184, sheet 625D, NARA microfilm publication T9 (Washington D.C.: National Archives and Records Administration, n.d.), roll 0231; FHL microfilm 1,254,231. 5. Anne, wife of Patrick Brown, died 24 Dec 1878, just eight months after her sister, Ellen Burns Brown. See image in previous blog post on Illinois Prairie Years. 6. John and Ellen Burns Brown died in Columbus, Franklin, Ohio - John on June 3, 1873 due to a train accident, and Ellen on April 11, 1878 of cancer. William Henry was the only child to come to Illinois. See previous blog posts on Brown-Burns Connections, John and Peter, John and Ellen. 7. The County – Belleflower, The Pantagraph, Bloomington, IL, electronic newspaper, Newspapers.com, 23 May 1883, p. 3, col. 5, bottom. Dropsy, the retention of water, can be indicative of congestive heart failure. 8. 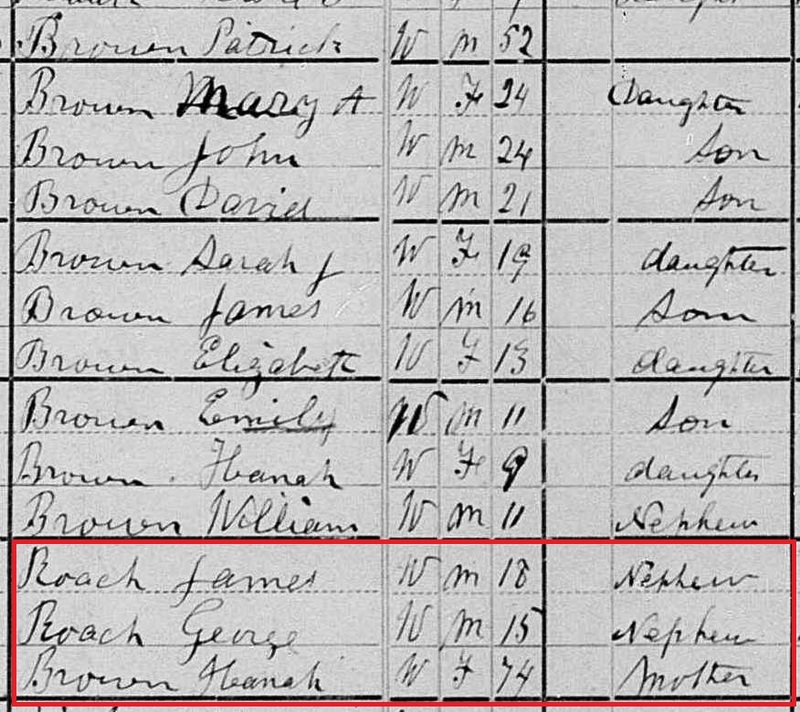 While the 1870 U.S. Census shows James (about 1865) to be younger than George (about 1862), we know from George’s baptismal record (see above) that George was born in January 1865. The 1880 U.S. Census shows James’ birth about 1862, as does his death certificate. The enumerator probably switched the year of birth for both boys in the 1870 census. 9. Wikipedia, Tuberculosis, https://en.wikipedia.org/wiki/Tuberculosis#History. Experiments in 1882 by Robert Koch, a German scientist, determined that germs (bacteria) caused tuberculosis. He found the disease was spread by coughing and was contagious. The medical community largely ignored his findings, even though other scientists had confirmed the discovery, until the mid-1890s. Robert Koch went on to receive the Nobel Prize in physiology or medicine in 1905. 10. Barrett, Andrea, Hotaling, Mary, Rothman, Sheila, Tomes, Nancy, The Forgotten Plague, a documentary by American Experience Films, a Public Broadcasting Service film produced for television, 10 Feb 2015, Senior Producer Sharon Grimberg, Executive Producer Mark Samels. http://www.pbs.org/wgbh/americanexperience/films/plague/. Also available on YouTube at: https://www.youtube.com/watch?v=T0gNurmn274. 12. The occupation for James at his death is given as “driver.” William Roche/Roach, an assumed close relative of Thomas (see last post on Thomas Roche), was also a driver or teamster. It is possible that they worked together. 13. James Roach is buried in Lot 35, Block 3, Section F of Calvary Cemetery. Others buried in this plot are: Ellen Brown, sister of Hannah Kelly Brown; David Brown, Michael Brown, Hanora Brown (records show the first name as “Aurora”), and Mary O’Brien, all children of Ellen Kelly Brown. The remaining graves are descendents of Mary O’Brien. (See a list of burials in this lot in the previous blog post on Chicago.) Descendants of some of these people may be the individuals visited by a grandson of George David Roach in the late 1970s. 14. Compiled service record, George D. Roach, private, Company G, Sixth U.S. Infantry, Pre-1917 Military Service Records, National Archives, Washington, D.C.
16. Population of Salt Lake City from the 1880 U.S. Census was 20,768: from the 1890 U.S. Census was 44,843: from the 1884 City Directory for Salt Lake City for the entire county was 41,522. An average of the data given is about 30,000. 20. 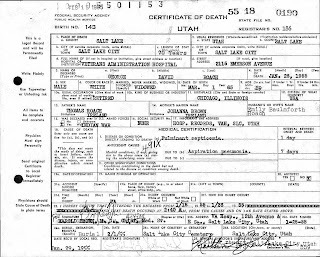 Address information for 1890 through 1953 for George Roach was obtained from the Salt Lake City Directories available on Ancestry.com. 22. 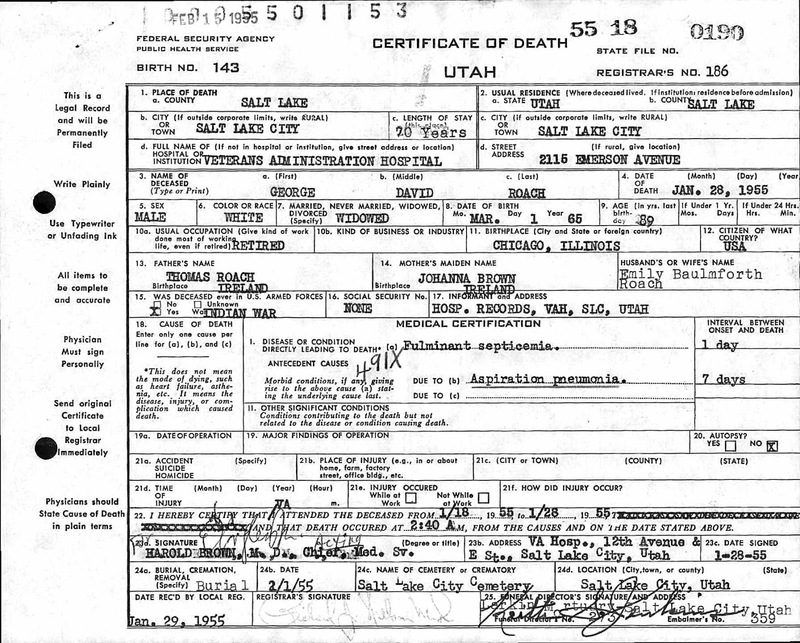 "Utah Death Certificates, 1904-1964", database with images, FamilySearch (https://familysearch.org/ark:/61903/1:1:XZ2F-LKM : 11 September 2015), Emily Balmforth Roach, 1917. 25. The National Archives at Washington, D.C.; Washington, D.C.; NAI Title: General Index to Civil War and Later Pension Files, ca. 1949 - ca. 1949; NAI Number: 563268; Record Group Title: Records of the Department of Veterans Affairs, 1773 - 2007; Record Group Number: 15; Series Title: U.S., Civil War Pension Index: General Index to Pension Files, 1861-1934; Series Number: T288; Roll: 397. Application number for George D. Roach is: 1704880. The record has been requested (November 2017) from the Bureau of Veterans Affairs where the file is located. To date the file has not been received so the actual amount of George’s monthly pension payment is not known. The pension was based on age. The 1927 version provided a payment of $20 per month for persons sixty-two and older; $30 per month for ages sixty-eight and older; $40 per month for seventy and older; and, $50 per month for those ages seventy-five and older. The date of birth given by George at his enlistment would have affected the amount of his pension. 26. Ancestry.com. U.S., Social Security Applications and Claims Index, 1936-2007 [database on-line]. Provo, UT, USA: Ancestry.com Operations, Inc., 2015. Records under George David Roach.